Giving my 5-1/2 year old the option on what she wanted to use for her little buddy's 6th birthday.. she picked this Blue Ribbon stamp set and wanted it in blue and red. 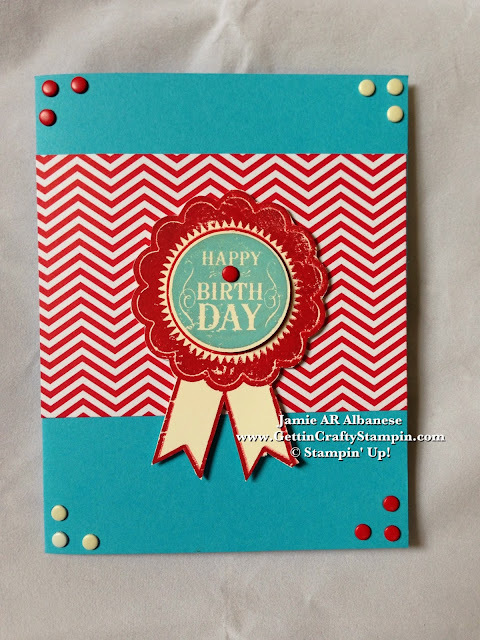 Whipping my Color Coach out, I paired this card for a sweet birthday hand-stamped card for a sweet boy! Paired together with the aide of my Color Coach (#130118) a favorite tool of mine! 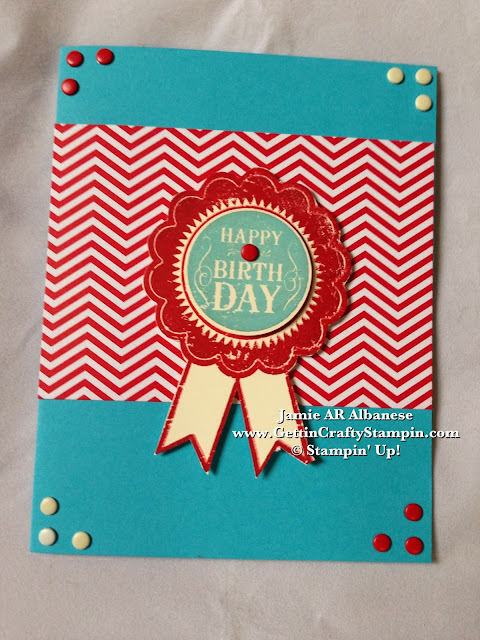 Real Red, Tempting Turquoise and Very Vanilla create this great card! Adding these adhesive backed Candy Dots for a fun accent reminds me of my own childhood love of those sweet treats! Layered over this base of Tempting Turquoise card stock and this fun Real Red Chevron Patterned Brights Designer Series Paper Stack for a bold card. 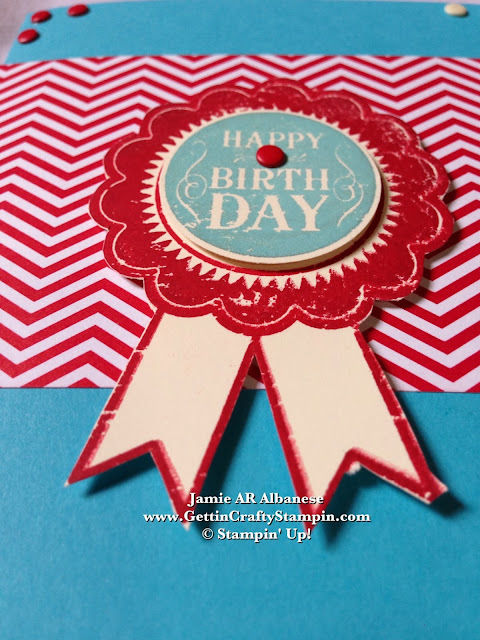 Stamping this Ribbon on Very Vanilla in Real Red ink for a bright POP! 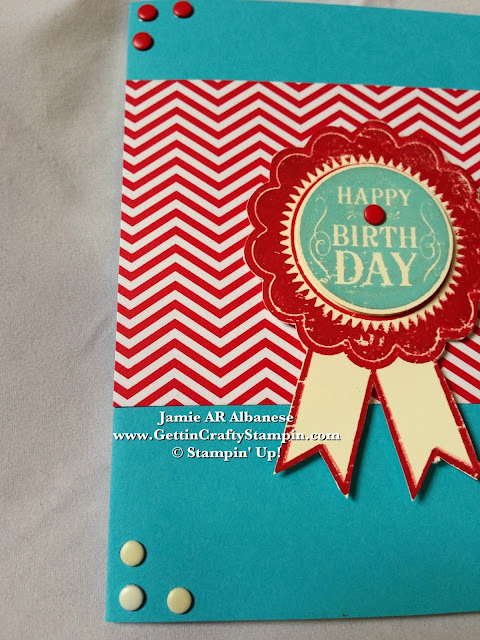 This color coordinated Tempting Turquoise stamped 'Happy Birthday' to the center is easy! This stamp set coordinates with the 1-3/8" Circle Punch and the 2-3/8" Scallop Punch for ease in cutting/popping out! Layered with the Stampin' Dimensional Adhesive for stacking ease that POPS! Cards don't have to be timely! Our stamps and coordinating products, colors and tools make for easy and fun cards! YOU should be given a Blue Ribbon for coming by! I'm so happy you did. I try to post daily and hope you will come by and often! 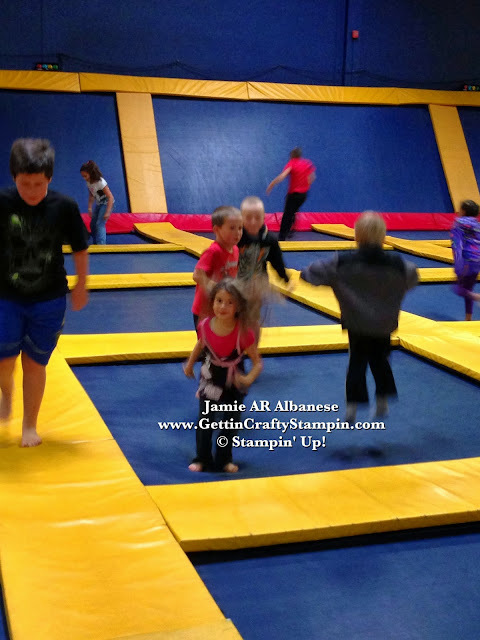 Bring your family and friends to join the fun. Creating cards and projects with my kiddos is a great passion of mine. Here my sweet 5-1/2 year old have creative license in making this card for her buddy. She pulled a cute Blue (and Red) Ribbon card together to celebrate him in style. I hope you will take time to create hand-stamped paper crafts with those you love... it's fun while creating special memories.